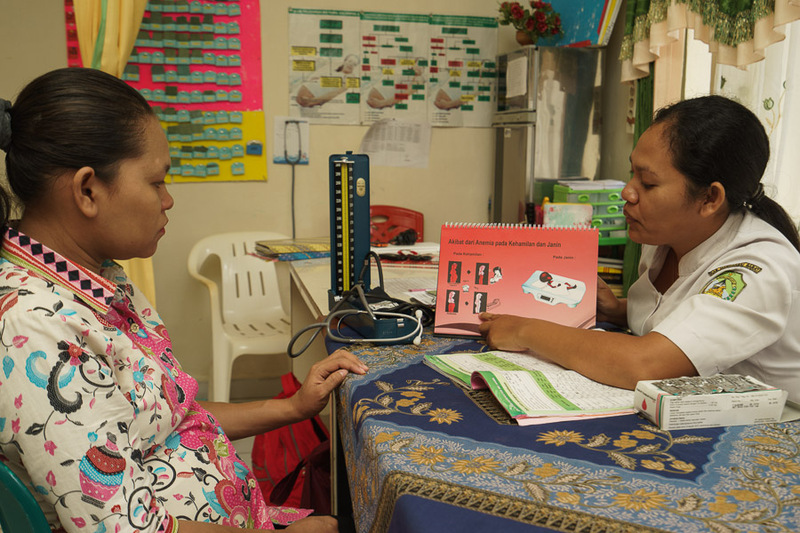 In the Manggarai Barat district of East Nusa Tenggara, midwife Rosina Flaviana Susianawati, popularly known as Osi, is leaving no stone unturned to ensure that women in her region have a healthy pregnancy, free from anaemia. Anaemia during pregnancy increases the risk of low birth weight for the baby. Her dedicated efforts to serve the community were strengthened by Nutrition International through an integrated micronutrient training organized as part of the MITRA program, running in the community for more than three years. The training, which was attended by other midwives and health personnel, covered topics such as: the critical first one thousand days of life, anaemia, iron and folic acid (IFA) supplementation for pregnant women, vitamin A supplementation for children under five, diarrhoea treatment using zinc and oral rehydration salts, drug procurement and counselling skills. Additionally, the health workers were presented with a set of tools including flipbooks on IFA and zinc supplementation, dialogue cards, and interpersonal communication booklets which they could use when providing nutrition counselling for pregnant women and caregivers of children under five. Osi has been an active advocate for maternal health in her region. In fact, she was the first person to pilot the use of IFA monitoring cards. She says, “The IFA monitoring card is an effective tool to track the number of IFA tablets consumed by pregnant women and link it to monitor the improvement in their hemoglobin levels.” Through use of these tools and regular counselling, Osi has observed a stark improvement in the hemoglobin levels among pregnant women. Osi has been a strong change agent in the community. Committed to take the cause of anaemia-free pregnancy and considering the benefits of the behaviour change initiative tools provided by Nutrition International, she advocated for the allocation of additional funds to print more IFA monitoring cards and flipbooks for distribution in more villages. She is sharing the best practices learned during the training and at her work place with many other midwives in the community. These are also being practiced at various sub-district, district, provincial and central forums.